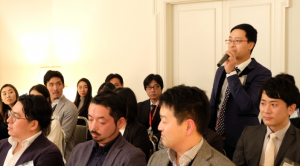 Home » News » MUSUBU Event Vol.3 – How Can young Japanese professionals pave their ways to the next level in the Canadian Society? The night begins with casual drinking and snacks, kindly prepared by the Chef of Consul General Residence. Whilst butlers swerved in between people and served drinks, the chatter did not stop. One was talking about how their projects are going and another were talking about their new projects that they hope to start. It was perfect atmosphere to discuss how can us, young Japanese professionals can pave our ways to the next level. The event was held in English, and both spokespersons gave excellent advice. 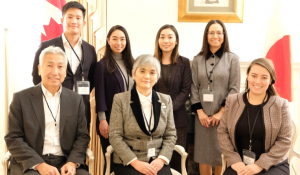 Gary mentioned the importance of building a network within the community when you are in a new environment, while Consulate General mentioned of how Japanese ethics are very beneficial in Canadian Society, and it is a rarity around the world. These words hit close to us as it was supported with their own personal stories. We will like to use this place to thank the various people who helped us make this event happen, Ms.Takako Itoh for graciously offering us the venue, Greg Johnson for his generous donations, and last but not least to every members, support members who came out to the event.